"Series 120 games are designed to be playable in under two hours by players familiar with the rules." Some of the early Traveller Boardgames were Series 120 games. CONTENTS: 17x22" map, 120 counters, 16-page rules booklet. "Following the French and British landings in the Crimean peninsula, the allies marched south to seize the Russian naval base at Sebastopol. 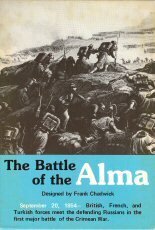 General Mentschikov's Russian army met them on the banks of the Alma River for the first major battle of the Crimean War-September 20, 1854." 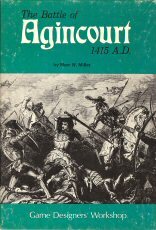 "In 1415 AD, Henry V of England defeated the numerically superior French army at Agincourt, thus proving the value of resolute archers and men-at-arms against mounted knights. This game explores the Battle of Agincourt with a blend of historical insight and enjoyable recreation." "On October 1, 1756, the armies of Frederick the Great of Prussia and Laudon of Austria collided at the small village of Lobositz on the Elbe. Clashing in a dense fog, the opposing players maneuver hidden units of infantry, artillery, and cavalry in this game of the Seven Years War." 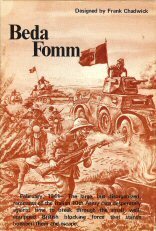 "A complete historical game-simulation of the Italo-British battle of Beda Fomm, fought 5 February, 1941." CONTENTS: 17x22" map, 120 counters, rules booklet. 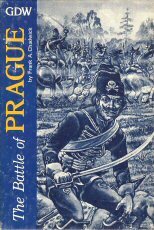 "The Battle of Prague is an historical Series 120 Game of Frederick the Great's victory over the Austrian army in 1757 during the Seven Years War. 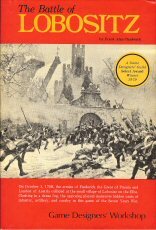 The battle was marked by Frederick's brilliant flunking movement and subsequent destruction of the Austrian right wing." 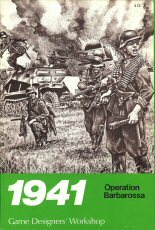 "1941 is an historical Series 120 game of the German invasion of the Soviet Union, covering the initial onslaught of June through December 1941. The 17 by 22 inch game map displays the western portions of the U.S.S.R. where the crucial events of the invasion occured. The 120 counters represent the corps, groups, and armies which fought in the campaign. The rules booklet provides complete rules and charts governing play of the game. 1941 is recommended for ages 12 to adult."